Nicholas Isherwood studied with Richard Miller at the Oberlin Conservatory and College (B.M., B.A.) and privately in Italy (with Sara Sforni Corti and Roberto Benaglio). He completed a DEA in musicology with a thesis on the vocal vibrato at the Ecole des Hautes Etudes, together with the Ecole Normale Supérieure and IRCAM under the direction of Hugues Dufourt and Doctor Marc Yana. 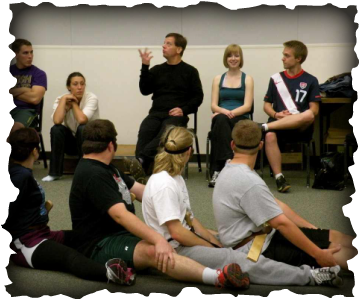 Isherwood has taught master classes for over twenty years. This has brought him to the Salzburg Mozarteum, the Xenakis summer courses in Paris, the Abbaye de Royaumont, Ars Musica in Brussels, the Darmstadt Ferienkurse, the Reims Conservatory, IRCAM, the CCMIX, the Paris Conservatoire, Cal State L.A., the ARIAM Ile de France (two courses), the University of Washington, Cal State San Francisco, the Cologne Conservatory (summer program in Montepulciano), Calarts, the ARIAM Ile de France, Pont Levoy, the Conservatorio Giuseppe Verdi in Milano, the Institute for the Living Voice (Berlin), the Troyes Conservatory, UNAM and CENART in Mexico City, the Gallarate Conservatory, the Normal University in Taiwan, the conservatory of Morelia (Mexico), the Wellington University (New Zealand), the summer academy in Cortanze, Italy (with Mirella Freni), and numerous appearances at the Stockhausenkurse in Kürten, Germany. He has lectured at the Hôpital Foch in Paris, the Leipzig University, the Freie Universität in Berlin, the Normal University in Taiwan, Stanford University, UCSB and IRCAM. He has participated in panel discussions at the University of Toronto with Helmuth Rilling. Isherwood co-taught a semester long course on voice and electronics with Harvard Professor Hans Tutschku at the Montbéliard Conservatory. He was chosen by SMU to teach its voice students studying in Paris. Isherwood has been visiting professor of voice and opera at SUNY at Buffalo, Notre Dame, Calarts, the University of Oregon and the Ecole Normale de Musique in Paris. He has published articles in the Journal of the Scelsi Foundation and the Journal of Singing and his book The Techniques of Singing was published by Bärenreiter Verlag in 2013.